Let’s say you’ve just picked up a dazzling used sewing machine at a garage sale. Why dazzling? It has more knobs and buttons than a jet cockpit and you have no idea with to do with them. Or, your beloved gifts you with a bargain Singer and suggests you can put it to good use to help out the family budget. See above definition of dazzled. Or is it dazed? More likely, you wander by a fabric shop and a gorgeous piece of silk in the window lures you inside. Before you know it, you’ve got the silk, a pattern and directions to the nearest sewing machine store tucked under your arm. Now what? You can’t put it off any longer. 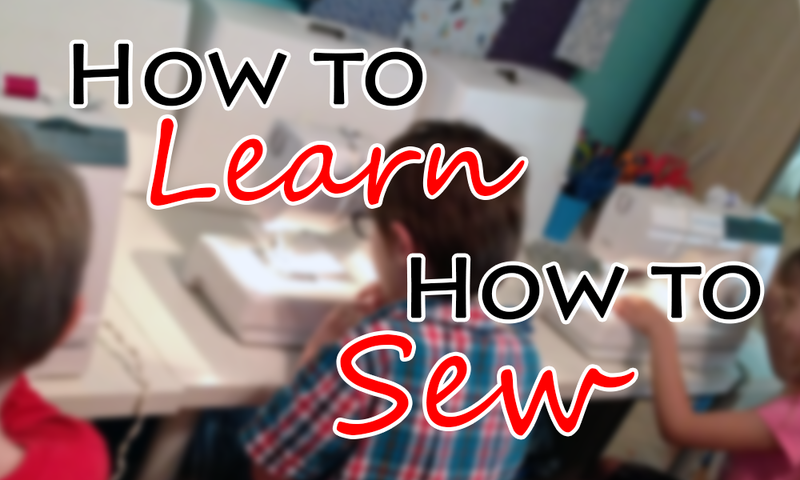 It’s time you learned how to sew. You have many options to learn how to sew your own clothes or other items. Sewing today has produced a large sewing community. Once you are connected, you are on your way. First of all, you can take a sewing class. Check online in your city for a sewing school or a sewing workshop offered by a store that sells sewing machines and/or fabric. Many adult education programs offer beginning sewing classes as well. If you can’t find a structured class, consider buying a book for beginners. It is not hard to find easy sewing projects for beginners to try on your own. First, read your sewing machine manual so that you can thread the machine properly. Then get yourself a scrap of fabric, such as an old dish towel. Begin by putting very light pressure on the pedal and run the machine forward for about twelve inches. Stop, keeping the needle inserted in the fabric. This step is important because otherwise the fabric will drift away from the needle and your thread will pull loose from the fabric and the bobbin underneath. Lift the presser foot, turn the fabric around and sew another twelve inches. Do this enough times so that you can create a straight line of stitching. You are not in a race, so just go slowly and gently guide the fabric with your hands. You can cut the thread after each line of stitching or turn the fabric with the needle inserted in the fabric and just keep going. When you are comfortable sewing a straight line, speed up a little. Practice sewing faster—but don’t race the machine—then slowing down, speeding up, then slowing down. Do this until you feel comfortable controlling the speed of the machine. When you are confident that you can sew in a forward direction, practice sewing backwards. Familiarize yourself with the reverse button or dial on your machine. On some models you have to keep a button pressed while you sew. In this case, use one hand to guide the fabric, and engage the reverse mechanism with your other hand and stitch slowly for twelve inches or so. Stop with the needle in the down position, then raise the presser foot. Turn the fabric around and sew in reverse again until you can sew a straight line of stitching backwards. Remember, if you find this maneuver tricky at first, it will become easy fairly quickly. Also, it is rare that you will sew for long stretches in reverse. Often, this function is just used for tacking down the beginning and/or end of seams, which is easy to master. When you have built up some confidence, try sewing a square to practice turning corners. First, sew another line of stitching. Stop, keeping the needle inserted in the fabric, lift the presser foot and turn your fabric at right angles to the needle and lower the presser foot. Sew and repeat this until you have a square of stitching. If you keep your needle in the down position when you turn your fabric, you should have no trouble practicing this maneuver and getting sharp corners. Last, practice sewing curves. Using some tracing or butcher paper (paper bags work), or copy paper, place a saucer or salad plate on the paper and draw a circle. Make half a dozen circles but do not cut them out. Very carefully, place the paper under your needle, lower it and very slowly begin sewing, guiding the paper as you go until you have completed the circle. Repeat this enough times until you are comfortable sewing a curve. You may not master all of this the first time you sit down to sew. Don’t worry. After several practice sessions, you will be ready to begin a project. Start with an easy project. Some ideas for easy sewing patterns for beginners include placemats and napkins, table runners, a simple pillow cover or a skirt with an elastic waistband. Go slowly and as you sew beautiful garments and household items, your confidence will build and you can raise the bar on the degree of difficulty. When you are a newbie sewer, especially if you are learning on your own, use inexpensive fabric. Don’t be discouraged if you find you have to discard a sewing project because it was more difficult than you thought or didn’t turn out exactly as you imagined. This will be easier to do if you haven’t invested a lot of money in it. If possible, find yourself sewing groups with whom to trade sewing tricks and techniques. The old-fashioned sewing bee is still a good idea, even if you find a blog and conduct your group sewing on line. These days, often you can learn to sew online. When you come a technique that befuddles you, google it for directions or look on YouTube for a video. Realize that many of the videos you find online are made by amateurs who may be skilled sewers but not skilled at communicating what they know. If you find a video or instruction confusing, don’t be discouraged and just search for a better example. You might need to look at several videos before the technique becomes clear to you. Look for sewing forums to help you out. If you search for sewing sites or sewing forums, you can find a community of sewing friends who are willing to share their experience and knowledge, and also give you encouragement when you are unsure about your skills or need a pat on the back after you have completed a difficult technique. Think about starting your own sewing blog as a way to motivate yourself and give encouragement to others who are learning how to sew. It is a wonderful way to document your own progress and show others your highs and lows. Ask for comments on your posts and leave comments on other sewing blogs, leaving your own blog address, to help people find you. If you are thinking that it is hard enough to learn sewing without learning how to blog, you may be surprised at how easy it is to join the blogosphere. Try blogspot.com or wordpress._______. They offer easy, free sites with lots of instruction. Do take photos of your work as you proceed and then when it is finished to share with your readers. Be sure to tell your friends about your blog and enjoy their praise as you advance in your sewing career.